The lateral epicondyle is a small bony eminence located on the external surface of the humerus bone, at the level of the elbow joint. 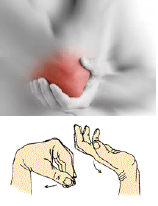 It is the site of insertion of the tendons of the wrist extensors muscles (see image on the right). In the case of a lateral epicondylitis, studies show that there is no presence of inflammation involved in this pathophysiology. Instead, the condition seems to be caused by degenerative changes in the tendon that attaches the wrist extensor muscles to the elbow. Indeed, when repetitive movements are produced with the wrist or the wrist extensors contract in an inadequate manner, it produces a series of microscopic lesions in the tendon of these muscles. WHAT DO PHYSIOTHERAPY TREATMENTS CONSIST OF? Firstly, physiotherapy treatments will aim to reduce the pain present from a lateral epicondylitis with the use of electrotherapy (such as ultrasound or TENS), ice and proper education regarding the activities that may worsen your condition and thus that should be avoided for the time being. Then, your therapist will use a wide array of manual therapy and muscle relaxation techniques, and will prescribe effective stretching and muscle strengthening exercises to target the cause of the problem. Therefore, consult a Forcemedic physiotherapist as soon as possible for a quick recovery! We invite you to subscribe to our Facebook page to stay informed about all the services offered and that will help you gain a healthier lifestyle.